Have you missed out on a guided painting event, or have you seen a painting in our Gallery or on our wall that you REALLY want to paint? Would you like to create a project, but don't know how to get started or need a little help? Want to brush up on drawing, painting, or multi-media skills or techniques? We can one or more private lessons just for you (or you and a friend?) at any time, including weekends. Just come in, call, or use the Contact Us tab (under About tab above) to inquire about private lessons. Let us know what you would like to learn or do. 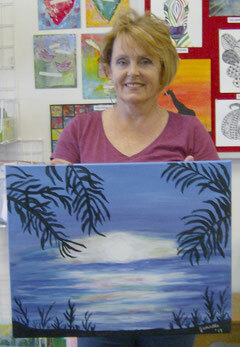 You can arrange for a one-time art session, a mini-workshop for a small group, or ongoing art lessons. Fees are currently $20 per hour including the cost of supplies and materials. If you would like to paint one of our 16 x 20 inch canvas paintings (from the Gallery), the cost is $30 plus $10 private lesson fee. Gather up a few friends or family members to paint with you (at least two other painters) and avoid the private lesson fee(s)! Another option: Try an Open Paint Studio on Wednesday afternoons and paint on your own - we will provide everything you need including self-guided painting instructions and assistance when you need it. We are eager to work with you and help you complete your project or learn a new art skill! 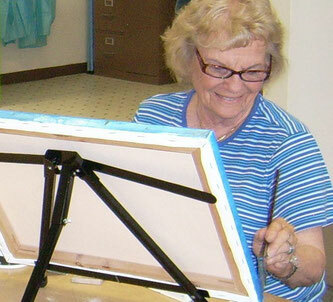 It's never too late to try something new and bring out the 'inner artist' in you!